This article is a personal story. It’s about something I’ve been struggling with for years (my entire life, really). And it strongly presented itself again in the past couple of months. The reason I choose to share this with you, even though it feels a bit vulnerable and uncomfortable, is because I think reading my story can be helpful to you. I don’t want to waste your time, so before I dive into it I’ll first help you determine if my story might be relevant to you. Are an introvert and/or HSP (highly sensitive person) just like me. If you know me or have been reading my ezine for a while, you’ve probably heard me refer to my ‘inner hermit’ before or heard me call myself a hermit. My energy drains from social interaction and even from just being around people. And yes, this also happens even if the activity is something I truly enjoy and I really like the people I’m with. Of course, every introvert has extravert moments and vice versa. But if I want to be able to function, be happy and healthy AND be able to fulfill my mission, I need to spend between 75 – 90% of my time alone. As you can probably imagine, achieving this in a society that is completely build and structured around extraverted people, who thrive on being around people, social activities and interaction, is a REALLY tough job. Over the years I have learned how to deal with this. I learned how to manage my energy; how to restore myself when I was drained; how to set boundaries; how to say NO; etc. I also learned how to structure my business, my programs, my services and my marketing in a way that works for me. This year my business grew a lot, and much faster than I expected. Which is of course wonderful news and I am very, very grateful for it. But….as a result I had too little time for myself again. I felt stressed, completely drained, unhappy, and totally disconnected from my soul and the world – which is how I always feel when I don’t spend enough time alone. How the hell am I going to take good care of myself, make sure I have plenty of time to be alone, make plenty of money, reach more people, have way less social interaction, publish my book and launch 2 new programs in 2013– all at the same time?!! I need to be alone most of the time yet I work with people. I don’t want to leave the house and I hate to travel yet it’s my mission to reach millions of people worldwide. I want to make a difference in the lives of so many people, yet I can only have interactions with clients for a very limited amount of time. I love coaching people but it completely drains my energy if I have too many clients. I slowly found my answer this year, and made a powerful decision as a result of it. I decided to structure my business in a way that serves my inner hermit for 100% instead of 90%, just as I have already done in my personal life. The rest of the time I can develop and launch 2 new programs, work on my business and marketing, publish and launch my new book, etc. etc. Right now, I am restructuring my business and programs to make this decision a reality. I can only do this now, after I learned how to apply marketing and business principles to my business in a way that worked for me. Because I finally accepted and embraced my inner hermit completely, and to acknowledge it as my gift and my strength instead of seeing it as a burden I had to work around. It is entirely possible to be a hermit or an introvert and run a successful business at the same time. 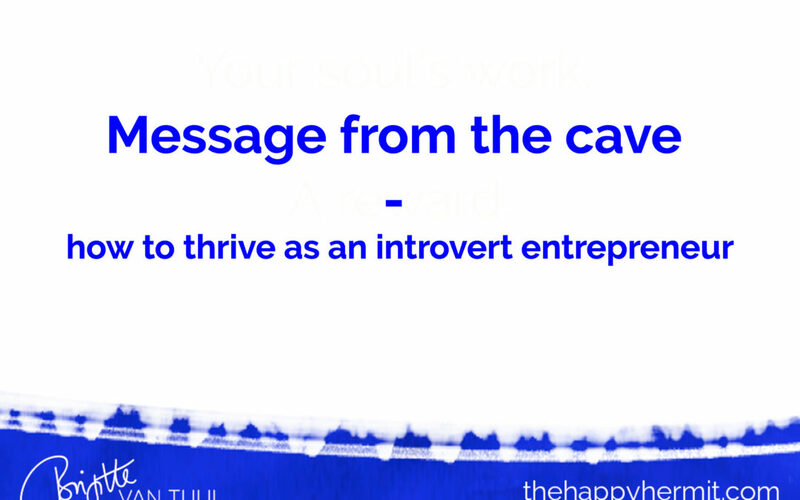 Being an entrepreneur gives you the freedom to structure your life and your work in a way that serves you 100% – especially when you are an introvert! Enjoy, share and celebrate your uniqueness! It is your gift to the world. I hope reading my story inspired and served you. Be YOU, and build your ENTIRE business & life around it! P.S. : Want to do EVERYTHING in business & life YOUR way, too, without compromising, sacrificing or changing who you are? Want help, support, guidance & inspiration from me and a community of like-minded women to finally be 100% true to YOU? Check out my Divinely Selfish Community. That’s ALL about putting YOU first – so you can find fulfillment & happiness in serving others by thinking of YOU first. I’d love to meet & support you there! Curious to know what happened next? You can read my Spring update here, and see how it things are going 4 months later. AND how I’m doing almost 4 years later, in August 2016. And finally: why I no longer call myself a Happy Hermit. You can read that here. How you make yourself smaller without being aware of it. Triggered? Jealous? Annoyed? See it for what it REALLY is.